Spime Cloud Based Services, coupled with MapMan on the device, power new revenue opportunities through discovery, trial and monetization of premium services, applications, content and advertising. When connected users access dynamic content and update or add new static content onto the device. Content can be dynamically integrated, overlaid or stitched into the existing map data on the device. Spime’s Cloud Based Services are highly scalable and include a feature rich Application Store, encrypted downloading, payment gateway and funds disbursement services. Cloud Services are integrated with leading location based advertising and couponing 3rd party providers. 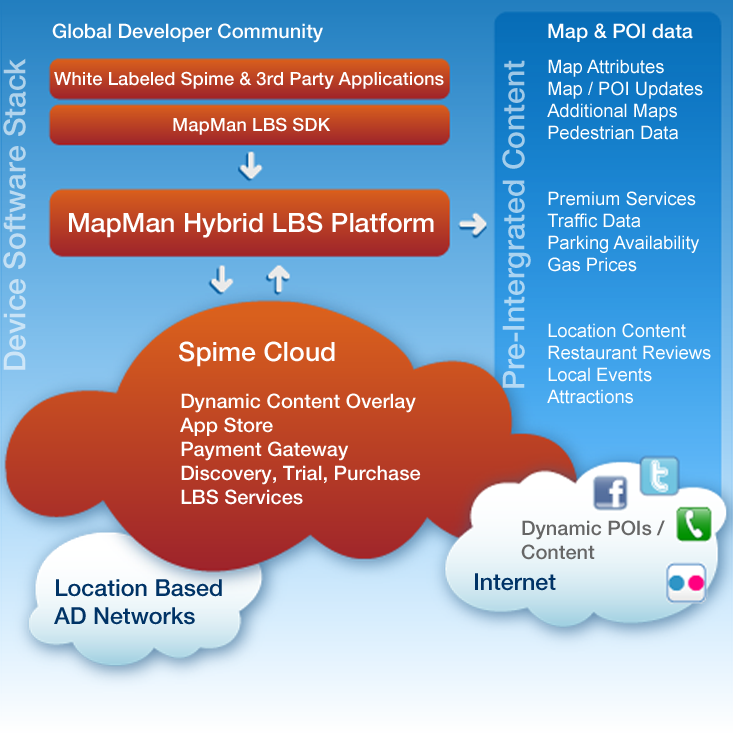 Coupled with MapMan, Spime Cloud Based Services provides Operators, OEMs, content and platform providers control over their roadmap enabling them to offer differentiated solutions to end users. Spime’s proven Cloud Based Services offering is service provider ready and can be deeply integrated into the user experience across a variety of device types. Customers can offer a consistent user experience and services offering. Dynamic content overlay from our data provider partners. ©2012 Spime Inc. All rights reserved. Spime® is a registered trademark of Spime Inc.